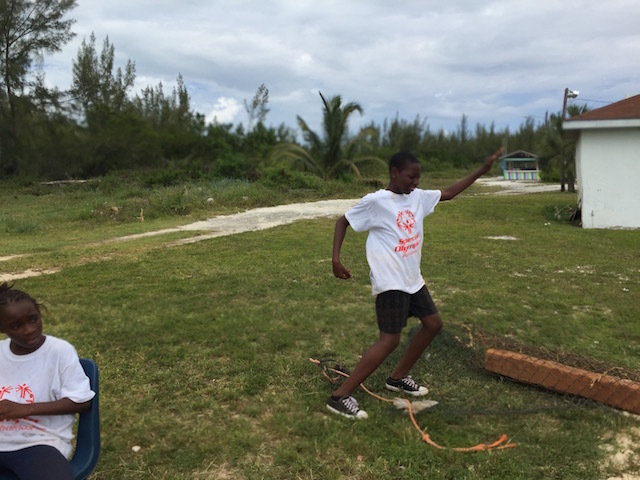 This past weekend we had plenty of fun in the sun with the Special Olympics Bocce Tournament in Tarpum Bay Eleuthera. 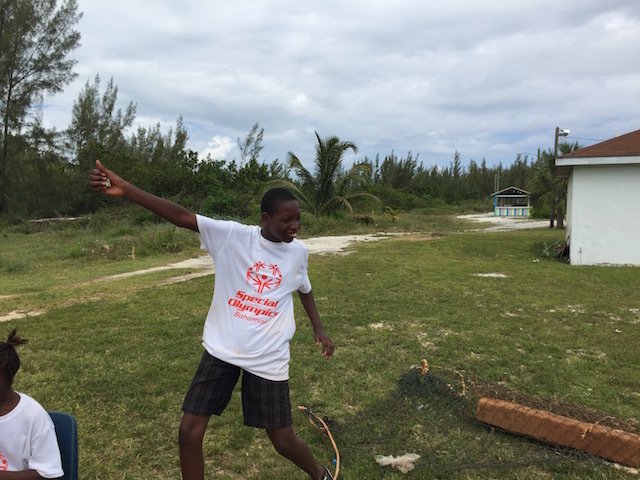 Teams came from Abaco, New Providence, Grand Bahama and of course Eleuthera. They arrived on Friday and got settled in to their accommodation before playing their first few matches on Friday afternoon. Later on Friday afternoon they were driven up to Governors Harbour to attend the Primary School fair on the ball park for their evening’s entertainment. Dancing, eating and socializing – generally getting to know each other and having some fun……..
Matches started again on Saturday morning – there were individual matches, pairs and then the team matches. As the day went on the sun grew hotter and the matches became more and more competitive – but it was such fun ……. Spectators were cheering all the competitors on and the tactics and strategies got more and more intense. 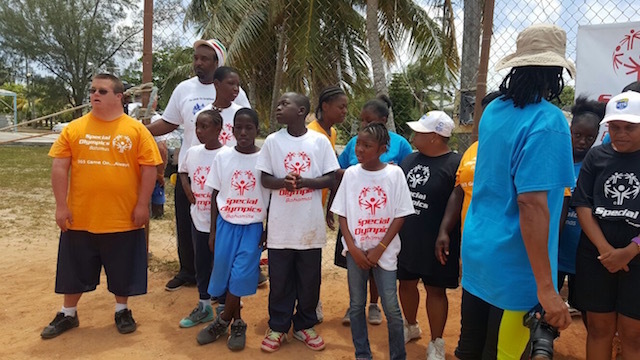 It was a joy to see our own team from the school here in Governors Harbour really begin to unite – they were considerably younger and much less experienced than all the other teams but they really rose to the occasion. Have a look at the pictures of Clifford’s victory dance after winning one of the matches – such a delight to see how excited they all were. Mr Tony Crean and Julian Carey both did a wonderful job of organizing the tournament without a great deal of time to plan it – but it all went smoothly and lessons were learned for the future. 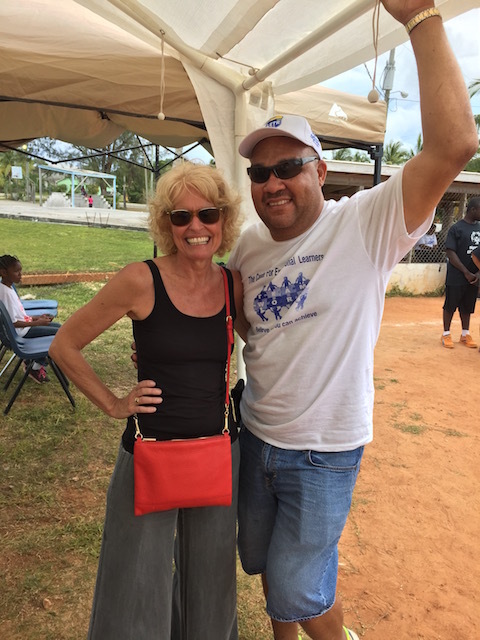 We do all hope that this annual tournament returns to the island – it brought such comradeship and camaraderie to all who were involved with it. 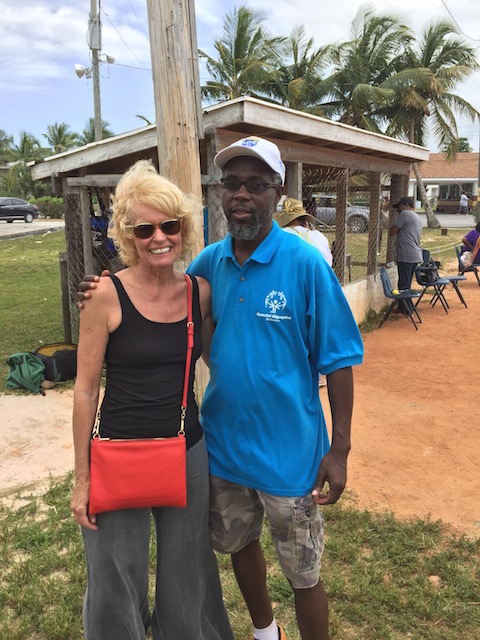 The Special Olympics has some amazing people working for them – Gilbert Williams who works from Nassau is a perfect example. He gave a lovely speech at the opening telling all the competitors that of course not all of them could win – but that being there and taking part was the most important thing. He also made sure to tell the competitors that is was very important to encourage and cheer on everybody – not just your own team. He has a very kind and gentle – but motivating way of addressing everybody – and it is clear that he is working with his passion for helping these people realize their best potential. It was a real pleasure to meet him. 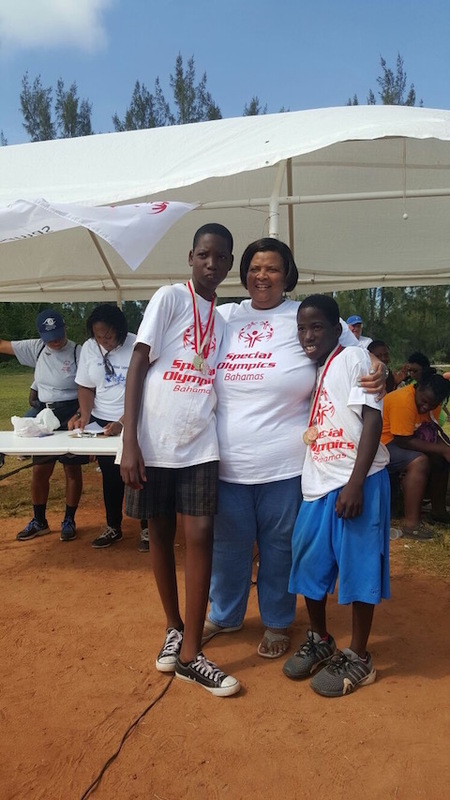 Amanda Carey who works at Stapleton School in Nassau with pairs competion winners Clifford and Joshua from Eleuthera ! Well in the end two of our students from Governors Harbour won the pairs section of the tournament – congratulations to Clifford and Joshua – an amazing result. And also huge congratulations to the full team – Clifford, Joshua, Remy and Leanne – who came second in the team competition. The 3 other teams were so much more experienced and older as well so we can all be particularly proud of our home team……. Mr Bill Holland – Principal of the Centre for Exceptional Learners with our home team – silver medal winners in the team event. 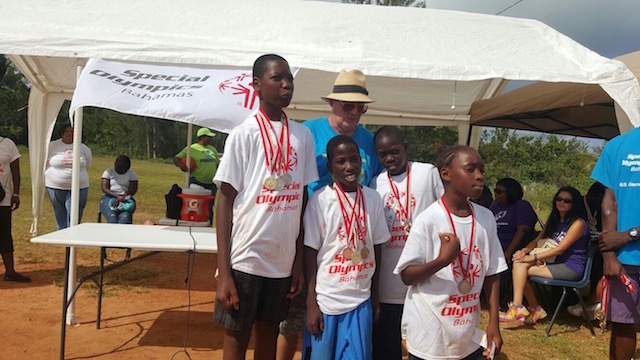 Medals were given out at the end of the day and there were plenty of big smiles – not least from me !!! 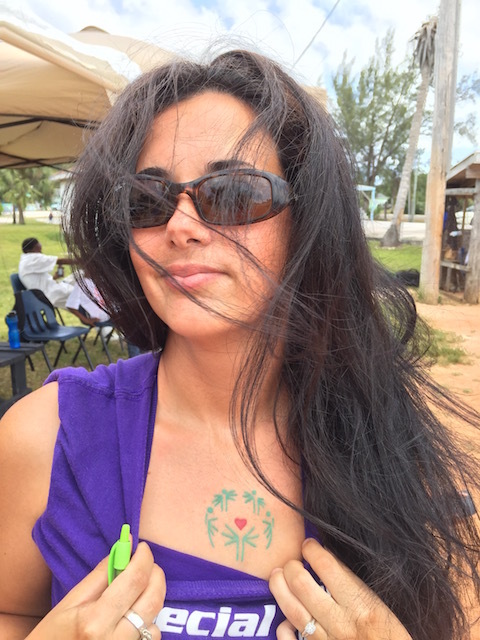 This lovely lady with the Abaco team actually has the Special Olympics symbol tattooed on her chest !